National parks are set aside for us all to enjoy, but climbing or hiking up mountains isn’t for everyone. Not everyone is physically willing or able to make the climb. Even when you are, you might not have time, or you might have children with you, and they might not be up for that strenuous steep climb up a mountainside. 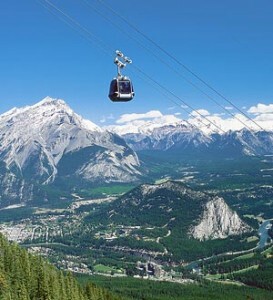 Just a few minutes ride from downtown Banff – there’s a bus that can take you too and from the lower gondola station – the four-person Banff Gondola offers an 8-minuted ride with 360-degree panoramic views around Banff to the summit of Sulphur Mountain, at an elevation of 2,281 meters. 486 ft). At the summit is an observation deck with several outdoor terraces, as well as a restaurant and a gift shop. There are also trails here – you can hike to the top of Sulphur mountain and take the gondola back down, or you can take the gondola to the top and hike back down, the choice is yours. Either way, don’t forget your camera; taking the gondola is a photographers dream. This gondola ride takes you on a 14-minute trip up to an elevation 2,088 meters. You also have a choice of riding in an open or fully-closed car. While you can enjoy the usual panoramic alpine vistas and access to meadows filled with wildflowers, springs, and other aspects of the alpine environment, one aspect of the Lake Louise gondola trips are the wildlife. Animal sightings occur almost daily, according to gondola operators. These sightings include grizzly bears, black and brown bears, cougars, lynx, mountain goats, wolves, elk, mule and whitetail deer, moose, big horn sheep, wolverines, and many others. The tour operators keep calendars of major animal sightings, and during the months the gondola is open for warm-weather tours, most days see major animal sightings. In September 2010, for example there were 15 days with major animal sightings; in August there were 29 days with animal sightings! What’s more, many of these were grizzly bear sightings from the Lake Louise sightseeing gondola. Want to schedule a gondola ride? 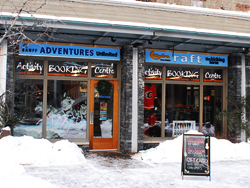 Check out Banff Travel.